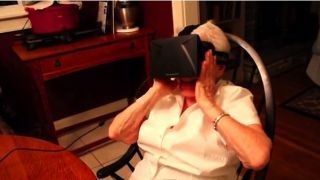 A weekend YouTube video of a 90-year-old grandmother trying out Oculus Rift's virtual reality headgear might bring a smile to even the most jaded gamer's face. "This is something else," she says in wonderment. "Am I still sitting where I was? Holy mackerel." She even asks if the images she's seeing were actually photographs taken in Tuscany. Now, VR is cool for just about everyone, but she seems to take particular delight in the tech's transportive powers. "If I ever explain this anybody else, they won't believe me," she says, hands gripped to goggles. As long as she's having fun, we don't think it matters all that much. For more bite-sized news nuggets, click here.